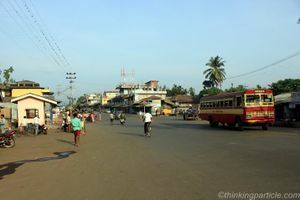 A friendly, dusty little town on North Andaman. The main attractions lie not in the town itself, but this is where buses arrive and depart from. 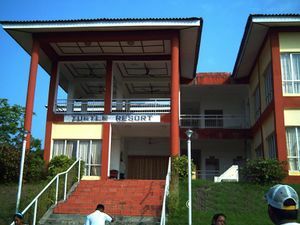 Tourist accommodation is located in the nearby village of Kalipur. Sea Plane: After a brief period of operation, the Seaplane services are permanently closed in 2015 without citing any possibility of re-start. 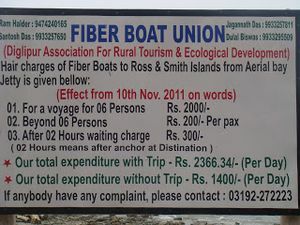 Boats: Ferries to/from Port Blair few times (1-2) in a week and takes around 10 hours. Overnight boat journey is quite a delight for those you want to experience a voyage in open sea. Quite an intriguing journey it is. Road: Road trip from Port Blair to Diglipur is one of the highly recommended adventures of Andaman Islands. Andaman Trunk road runs north from Port Blair to Diglipur with some Islands connected with ferries which drop the vehicle on other shore. 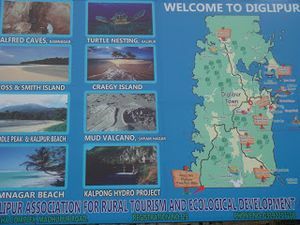 Rangat to Diglipur is well connected with no “roll-on” and “roll-off” ferries. It’s majorly a coastal route which sometimes gets into an inexorably thick jungle. Lush green journey of 10 hours through tropical rain forest of Andaman is a favorite among adventure seekers and those interested in plants and rural life of these islands. For information about STS busses, contact: 03192272007. Generally there is rush on the busses to Port Blair. Book your ticket in Advance. Besides STS busses, there are private busses and shared Jeeps on most of these routes. 2-3 private busses are also there for Port Blair including an AC bus (450 INR ticket). All the busses to Port Blair depart early in the morning. Shares autos also run on some of the routes (towards Aerial Jetty). You can also hire private auto. Ferries come from Port Blair a few times per week and take around 10 hours. You can book ferry tickets at the administration block. It's by the Dolphin roundabout, and the ferry ticket windows are on the outside of the left hand side of the building. Ferries leave from Aerial Bay jetty, a 10 Rs shared jeep or bus journey outside of town - about 1/2 hour. The Craggy Island across Kalipur beach is a little island known for fishes and corals. Ross and Smith Islands are twin Islands bridged by pristine white sandy beach that has a swimming pool lagoon on one side and a snorkelling paradise on the other. Mud Volcanoes could be witnessed in the green jungle of Shyamnagar and Diglipur. A trek through primary jungle leads to Alfred Caves- a cluster of amazing 41 caves. It is a den for swiflets and fruit eating bats. Turtles nesting could be seen in the beaches of Kalipur and Ramnagar during December- May. Snorkeling. There's some great snorkelling between Kalipur beach and the small island behind the pristine beach resort. Update (Jan, 2011): Kalipur beach is salt water crocodile-infested. Swimming there is hazardous. The beach is a source of sand flies, so use repellent. Update (Mar, 2014): We disagree about the update that Kalipur Beach is infested with crocodiles. Salt water crocodiles only show up in the monsoon season when the creeks flood and salt mixes in with the fresh water. There has only been one crocodile incident in the past decade in the Andamans, and that was at Havelock. The small island across from the beach near Pristine Beach Resort is called Craegy Island, and the snorkelling there is fantastic! The reefs adjacent to this beach (about 200 meters north of Kalipur Beach) and particularly the reefs at Craegy Island are mostly unbleached coral, and support a huge variety and volume of colourful fish and sea creatures. Craegy Island is about a 20-minute swim from the beach near Pristine Beach Resort (if you use fins). The tiny little sand flies can be annoying, but a local product, neem oil, is very effective in keeping them from biting, and walking on the wet part of the beach will keep them away. Climbing Saddle Peak. Climb to the highest point in the Andaman islands and marvel at the scenery. The climb itself is great too - the path follows the beach and then cuts through different types of jungle and forest up to the top. You can buy your 250Rs permit from the forestry department office at the trailhead which is open from 6am to 2pm - there's no need to buy it in advance. You can get a guide from Pristine Beach Resort (100Rs) or go by yourself. To get there follow the road through Kalipur as it turns into a track, then a small path. At the very end of the path (about 1/2 hour) you will find the forestry department hut where you should buy your permit. After that, follow the trees with the red0and-yellow painted bands. The path follows the beach, so if you lose it just go down to the beach and you'll soon see then again. To cross the streams you can either wade or go down onto the beach where the outflow will be leapable. When the beach curves round to the left look for the sign on your right and then follow the red bands painted on the trees. It's difficult to get lost - there's only one path. A Tasty good food in Pristine Beach Resort in Kalipur. In Diglipur there's the usual Indian fare. There are a few friendly bars in Diglipur and in Kalipur. Ross and Smith Islands - Hire a local fishing boat for a day trip to these beautiful islands. To get there, get a bus to Aerial bay jetty from Diglipur. If you continue on past the jetty there's a small Forestry Department shed from where you can purchase the permit you will need. You can charter a boat in the Aerial Bay village, just ask around. There's a friendly lady who speaks English in a small chai & pan stall opposite the jetty who can help you charter one too.Ross Island is generally specified in the must see places list of tour operators.The Island boasts about the life prevailing during British rule, if you are the type not interested in history and seeing abandoned buildings, you can give the island a miss as it is a waste of time.The charges per person are Rs 20 and Rs 10 for a still camera.